Family Owned & Operated "Since 1963"
The Crestview family began many years ago with 6 Nimrod tent campers on a small country lot. Since then, they have built and outgrown four different locations in their efforts to provide better and more customer services. Today Crestview RV covers almost 22 acres in their South Austin/Buda and North San Antonio/Selma locations. 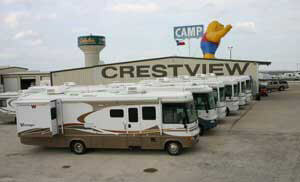 Crestview has developed into the largest and most complete recreational vehicle complex in Texas and surrounding states. Crestview's many years of experience has enabled them to offer the best products available and employ the most experienced staff to service our customers in one of the most complete, modern facilities in the RV industry. Crestview integrity, customer satisfaction, and growth has won them national recognition as USA's #1 Dealer of the Year. Jimmy took his time and listened to our wants and needs and took us to the right travel trailer. We were at other dealers who wasted our time. Thank you for having him on your staff. Very knowledgeable and patient we love our trailer camper. Crest view has it all. Parts, Service, our Saleman Jimmy. Jerry Jennings was easy to understand and didn't leave out anything. Jessie Vasquez was very patient and helpful, when he didn't know an answer he was willing to call me with it. Stephanie was a very nice person always welcoming. Cordial and friendly on phone. Kerry was extremely knowledgeable and extremely friendly, made our experience non stressful and fun. Mike spent lots of time with us explaining items. Would highly recommend both individuals especially Kerry. REDEX-RV: America’s Largest RV Dealer Network.